Alderman Gilbert Villegas speaks to the media March 28 in front of the home of the man who was shot in an ICE raid. Via 36th Ward Twitter feed. Singer-songwriter Steve Earle sang “City of Immigrants” about New York City but it could have easily been about Chicago too. Both cities were recently threatened by the Trump administration over federal immigration law. The Department of Justice sent letters to the cities and other jurisdictions claiming they are not in compliance with federal immigration law, giving them a deadline of June 30 to comply or the DOJ will cut crime-fighting grants. Despite all the tough talk from the president and Attorney General Jeff Session, officials in Chicago said they would not be intimidated by the aggressive Trump administration tactics. Mayor Rahm Emanuel said Chicago will continue to stand up for immigrant rights and its Sanctuary City status. “Regardless, let me be clear: Chicago’s values and Chicago’s future are not for sale,” Emanuel told the media in an email. The City Council recently voted to begin issuing a municipal ID that will be accepted by city agencies as valid identification. All of which is just not true say city officials and immigration lawyers. 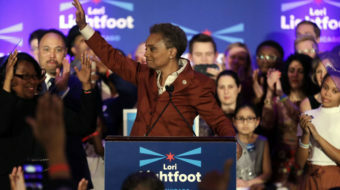 “Neither the facts, nor the law are on their side,” Emanuel said. 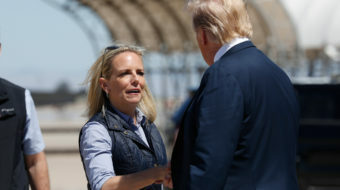 The administration’s efforts “to double down” on all undocumented immigrants is a “lot of bluster not substance,” according to Matt Adams, legal director of the Seattle-based Northwest Immigrant Rights Project. 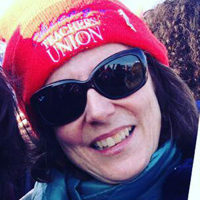 Adams was one of five immigration experts speaking to the media April 21 on a conference call organized by America’s Voice Education Fund to assess Trump’s first 100 days in office. “So far they haven’t been able to demonstrate that any of these jurisdictions are violating the law,” he said. Some local police and sheriffs “have expressed frustration at the federal government’s messaging attempting to scapegoat local law enforcement for not doing the federal government’s work,” Adams said in an email, responding to a follow up question after the call. 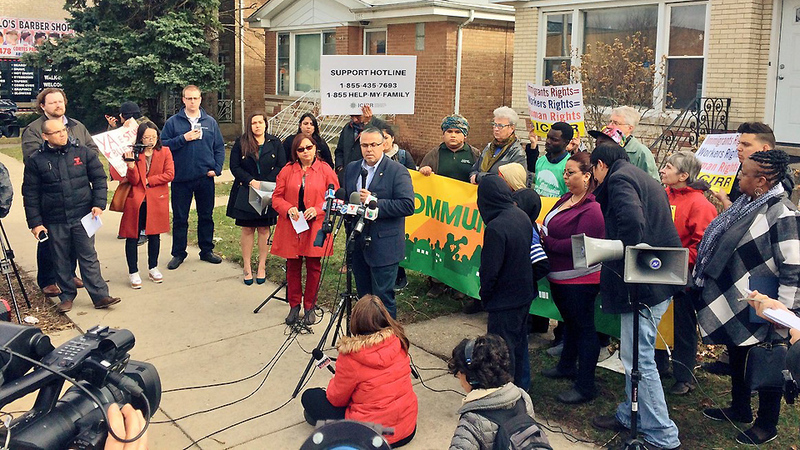 Recent ICE raids and deportations of immigrants whose only “crime” is being here without authorization have Chicago immigrant communities on high alert, especially after a legal resident here was shot by an Immigration Customs Enforcement agent after they raided a home on the northwest side. Felix Torres, 53, was shot in the arm March 27 during a botched ICE raid. Everyone in the home were either U.S. citizens or legal residents. The raid came a week after a highly publicized and larger ICE sweep of multiple states, including Illinois. ICE said that operation was planned during the Obama administration. But that doesn’t help quiet fears among families who may have undocumented relatives or children who are citizens and parents who are undocumented. 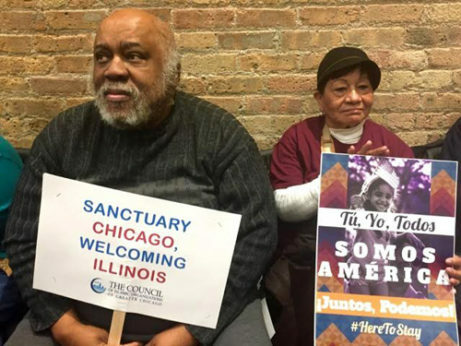 The Chicago Sun Times reported in a front page story that among the 45,000 Illinois participants in the Deferred Action for Childhood Arrivals program 43.5 percent of them have undocumented family members. DACA began after President Obama issued an executive order that gave young undocumented immigrants temporary permission to work and study in the country legally. Sixty percent of the DACA participants live in Cook County, which is where Chicago is located. At Chicago rally for immigrant, refugee and Muslim rights on Jan. 14. Photographer Aliza Becker. Here and around the country, communities have been organizing, speaking out and fighting back in various ways against the unjust immigration policies. Villegas joined community activists at a rally outside the family’s home March 28 and called for an investigation into the shooting. In an April 3 interview at his ward office, Villegas said his office tried to point people toward legal and other resources available to them through nonprofit organizations or the city’s Office of New Americans. “We’ve also said, you know what? You have rights,” he said. “The timing of the raid is what really gives us pause.” Villegas said the same day the raid happened Sessions announced his crack down on Sanctuary Cities and withholding funding.